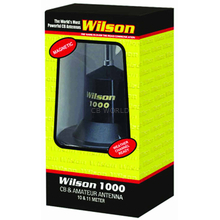 The Wilson 1000 Magnetic Base Loaded Antenna provides a highly portable mobile antenna for 10 meter and CB radios. The Wilson 1000 magnetic base is constructed from high impact Mobay Thermoplastic. 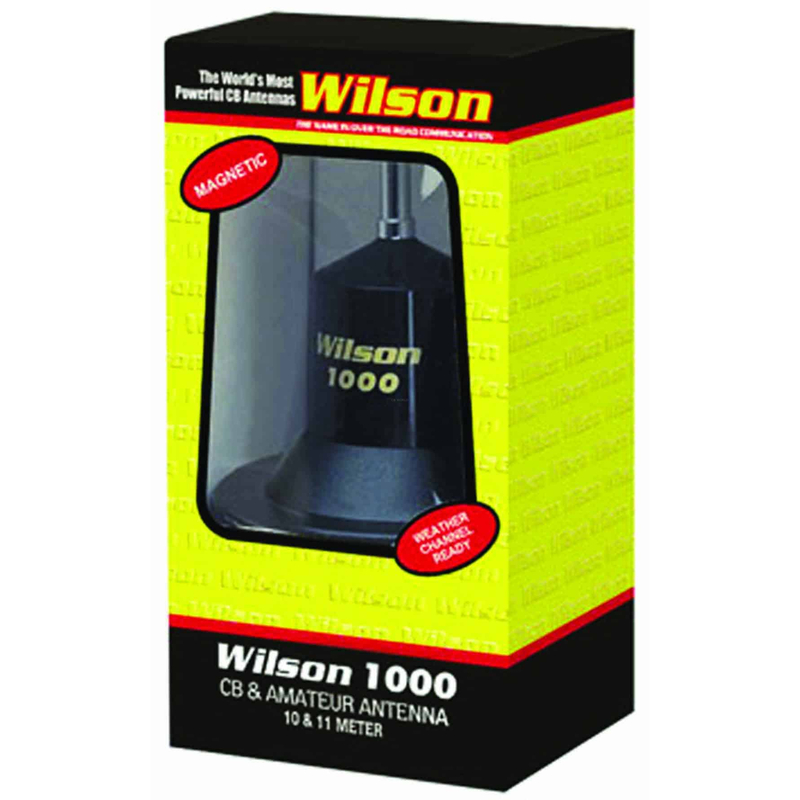 The space age thermoplastic construction is one of the many reasons that the Wilson 1000 is one of the most rugged antennas available today for CB radios. The exclusive design of the floating low loss coil eliminates approximately 95% of dielectric loss. This translates to better signal strength over the competition. Weather channel ready the Wilson 1000 features a 62.5 inch 17-7 ph stainless steel whip that provides a high signal quality. The coil is removable offering safe storage and easiest garage access. The magnet base features a vehicle finish protective coating that significantly reduces the chance that your vehicle will become scratched by repeated removal and installation of the Wilson 1000. The outstanding gain performance of the Wilson 1000 has been proven by power gain tests at Lockheed Corporations Antenna Test Laboratory. The Wilson 1000 tested as having 58% more power gain over a comparable K40 antenna. The Wilson 1000 provides 58 percent more gain on both transmit and receive! Rugged and great performance that says everything about the Wilson 1000! Just a great value in a CB antenna and a work horse that won't let you down. Wilson 1000 magnet mount antennas have a reputation. They just plain work! That says it all when it comes to two-way radio gear! The Wilson 1000 is suitable for use with CB & amateur radios operating in the 10 and 11 meter radio bands. The processed 18 feet of high quality RG58 coaxial cable terminates with a PL259 connector for ease of installation. In order to experience the ultimate performance from your Wilson 1000 magnetic mount antenna tuning for lowest SWR is required. 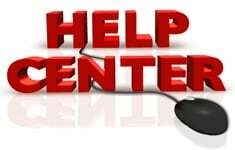 Be sure to review CB World's complete guide to tuning your antenna for the easiest method and complete expert step by step instructions.